Enough room to swing a cat? Or just a Bricks Hit House! With a new set of Cattens, our newly mins-passed skaters, now training with the cats, and more kittens having signed up over the summer, it seemed like the perfect time to arrange for WWC members to meet up outside of practice – and this time we went for something a bit different, that didn’t involve the pub! 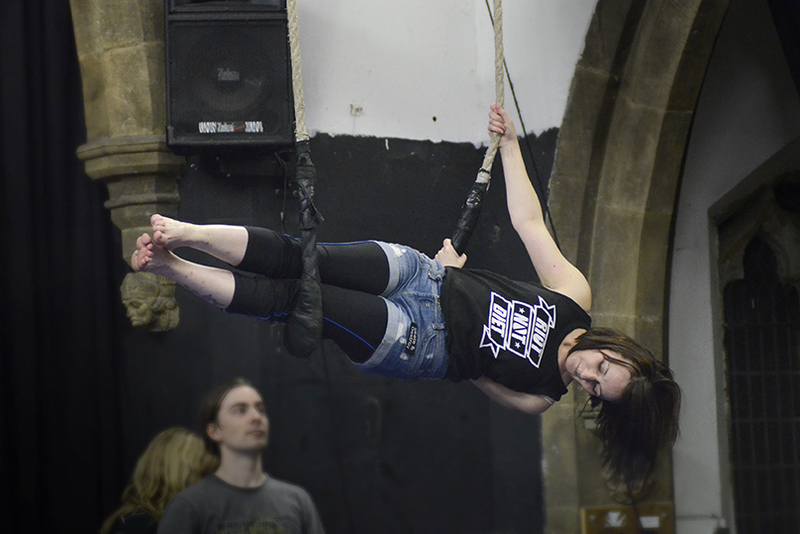 ‘Brick’s Hit House’ mentioned that she had happened upon the strange and intriguing pastime of trapezing, and many of us jumped at the chance to give it a go. 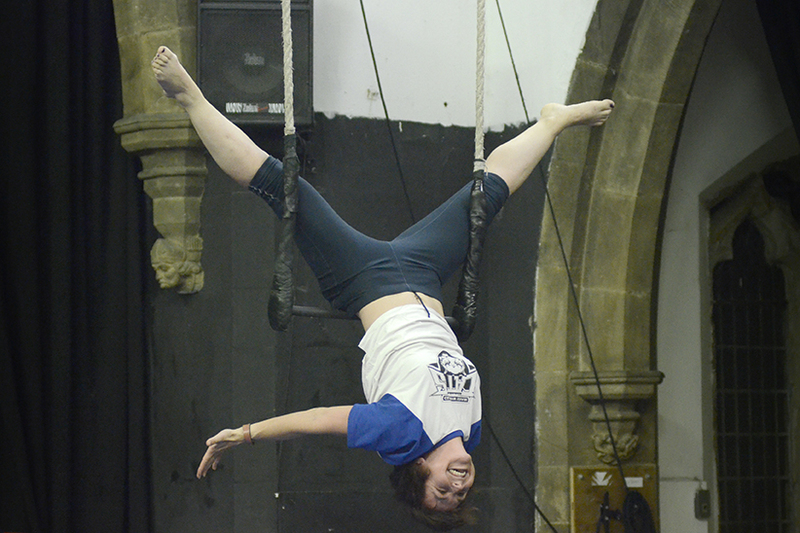 Nestled in an unassuming industrial street in Sheffield is the Greentop Circus Centre. As we drove through the colourful gates we had passed just moments earlier (after searching for a sign or a tent or a crowd of clowns or anything circus related!) we saw a small church. 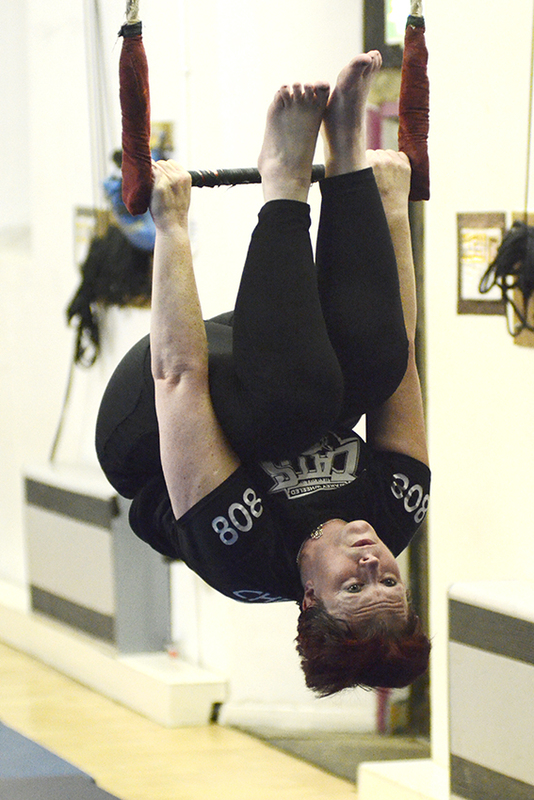 It turned out we would be swinging between the church rafters, very fitting for our fun team! After an amusing game of tig and an even more amusing yoga warm up (“My splits are stretching ‘cos the mats are slipping apart!”), we were helped along by two highly trained, and very patient, instructors. We split into two teams of five (sound familiar?) and took to the static trapeze swings. They don’t seem too high from the ground until you stand up on your tip-toes on them – we rollergirls are used to staying low! 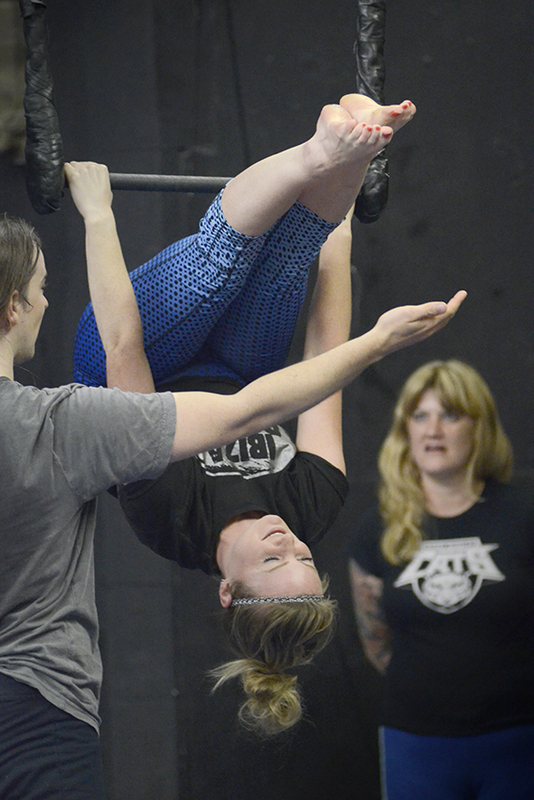 It was not long until we were all performing swing stands, mermaids, birds’ nests, gazelles, ankle hangs and even collaborating with the instructors to do fancy double pikes – yep, we even got the lingo down. The session runs as long as you can last for, which for us was well over two hours for our initial visit, all for only £7 each. The centre has been open for 25 years, and we can’t believe we have only just found it! The friendly bunch even sent us away with a tasty homegrown apple each. This place is so much fun, we will be back – once we regain our grip, that is!. The trip was a great chance for some team bonding ahead of our game against Liverpool Roller Birds B team on September 20. We would love it if any of you could make it along to support us in our first away game of the year. Grab tickets, and full event details here.